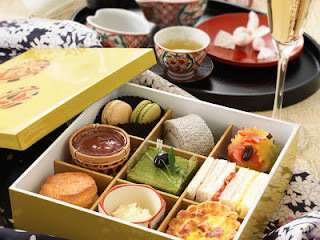 More hotels and tea rooms serve Japanese style afternoon tea recently. The Hotel Granvia Kyoto is one of them. But unlike others, they serve it with gyokuro. Usually, gyokuro is served by a small cup because rich umami (savory) flavor is condensed in it. Since the tea has very distinctive and strong taste, we often enjoy gyokuro as gyokuro, not with sweets (very little if any) . I mean gyokuro could overwhelm the food, or the tea could clash with tea food. According to their website, jam for scones are not made from strawberry. It's made from veges grown in Kyoto instead. Sounds interesting too. I haven't tried this afternoon tea yet, but I am curious how gyokuro is brewed, and how the tea food and the tea go well with. I should go to check it.